Media executives failed to adapt quickly enough to the internet, and then in a desperate attempt to catch up, handed too much of their business to Facebook and Google, he writes. 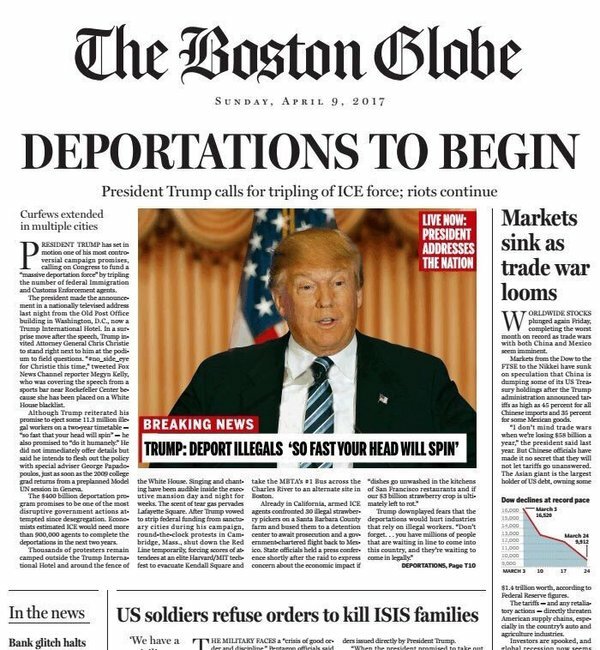 The Boston Globe publishes fake news as an editiorial-page spoof in April, 2016. Fake news might have proved more interesting to readers than the factual stuff. This sobering thought has churned angst over whether social-media falsehoods contributed to Donald Trump’s presidential victory, not to mention whether the upset win could have been foreseen. News consumers tend to believe reports that support their personal beliefs — an effect that psychologists call confirmation bias. People like to believe they’re right. In the election run-up, they clicked their way across the internet to prove it. As President-elect Trump selects the people who’ll help him govern, observers are picking through the rubble trying to understand the forces behind a Republican victory. Here our concern is news-media accuracy and ethics. Let’s start with something basic. What is fake news? “Pure fiction,” says Jackie Spinner, assistant professor of journalism at Columbia College Chicago, appearing on WTTW-Channel 11 in Chicago in a “Chicago Tonight” program devoted to separating fact from fiction in internet news feeds. But as the WTTW program points out, “fake news is on the rise, and it’s real news.” Some false reports, such as campaign endorsements from Pope Francis, survived many a news cycle.